This itinerary from the port of Miami includes time to explore the coast of Mexico and the islands of Cuba, Jamaica and the Caymans. Choose your MSC experience for special amenities like included dining, spa services and upgraded cabins. The MSC Armonia is famous for being split in half during renovations in 2014 to have a new center section added while in dry dock. The renovation, called the Renaissance Programme, took just eleven weeks to complete, and added a kids' spray park, refurbished shops, new child and teen areas, an enhanced buffet, a new lounge, and an extended restaurant. It also added 78 feet to the length. This medium-sized luxury cruise ship carries 2,679 guests in a casual, elegant atmosphere with updated cabins, enlarged restaurant areas, and special features for families, including a high ratio of staterooms that can accommodate third and fourth guests in one room. Built in 2001, the Armonia is a Lirica Class ship, sister to the Lirica, the Sinfonia and the Opera. With the latest in technology, the Armonia offers modern luxury and classic Italian style while providing guests with family-friendly entertainment and panoramic views of the sea. The ship has 9 passenger decks, 2 pools and 10 bars and lounges, along with a mini-golf course, video arcade and casino. In December 2018, she arrived at her new home in Miami, where she will provide cruises to Cuba and the Caribbean, including Cozumel, the Cayman Islands and Jamaica. The MSC Armonia has modern, well-appointed cruise staterooms for any vacation style or budget. All staterooms are air-conditioned and equipped with TVs, a mini-bar and safe. Wi-Fi is available for a fee. You can upgrade to one of MSC’s Signature Experiences where you’ll be showered with exclusive services to truly make your vacation one to remember. Experiences can include priority boarding, butler service, personal concierge, private sun decks, spa packages, fitness programs, and more. Size: 139 to 226 sq. ft. The most faffordable cabin on board is the interior room, with available Bella upgrade. The double bed converts to two singles, and the bathroom is equipped with a shower. TV, telephone, safe and mini-bar are also included. Wi-Fi is available for a fee. Size: 139 to 236 sq. ft. This ocean view stateroom may have a water view obstructed by ship structures or life boats. The double bed can be converted to twin beds on request. You'll have a bathroom with shower, a TV, telephone, mini-bar and safe. The Bella Experience is available for extra luxury. The Ocean View staterooms feature a window or porthole for water or dockside views. There is a double bed that can convert to two singles, a bathroom with shower, TV, telephone mini-bar and safe. Wi-Fi is available for a fee. Add a Fantastica Experience for extra amenities. Balcony staterooms feature a private balcony and a double bed that can convert to two single upon request. The bathroom is equipped with a shower. The room has a telephone, mini-bar and a safe. Upgrade to a Bella Experience for additional amenities. Suites, some with private balconies, feature a double bed that can convert to two twin beds, along with a spacious wardrobe, bathroom with tub, TV, telephone, a mini-bar and a safe. Extra perks available with Fantastica experience. The MSC Armonia offers indoor and outdoor spaces for relaxation and entertainment. With four bars and lounges and three venues for live music and dancing, it's easy to fill the evening hours with active or quiet activities. There is a Cigar Lounge on board as well as a traditional English Pub. If you like a good sing-along, make your way to the Red Bar for some piano music. The Starlight Disco is hopping each night with dance tunes and delicious craft cocktails. On Saturday evenings, when the MSC Armonia is docked overnight in Havana, a highlight of the entertainment offering is the addition of local Cuban music. Various musicians from the city of Havana will join guests on board to play local Cuban music and dance the evening away. With age-appropriate kids' clubs and "Kids Sail Free" cruising, you can be sure the kids in your life will enjoy the cruise experience. The mini-club for little tots keeps them busy with playing, running, swimming and kid-safe activities. Older kids have the Junior Club or the Teen Club, with its own disco for evening musical events. Kids can even get a special credit card to spend small amounts on board, with permission, of course! The favorite spot for kids of all ages is the Doremi Spray Park, where water toys rule. 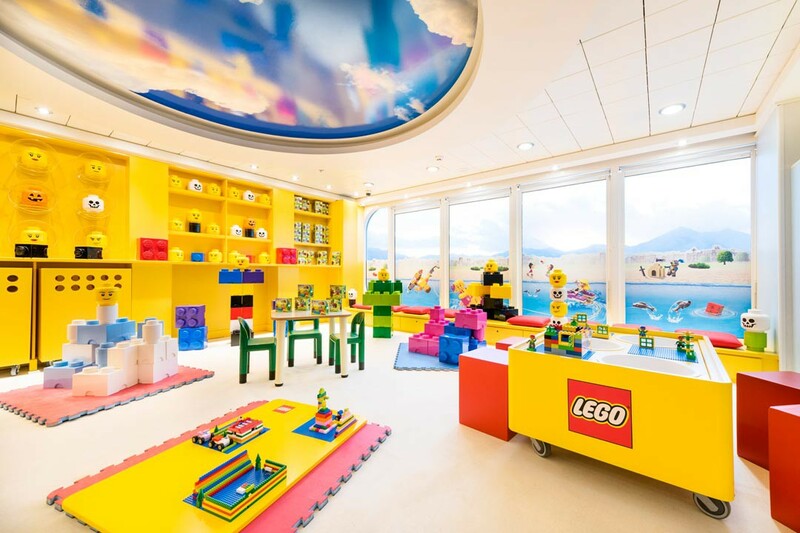 The MSC Armonia also has colorful play areas for kids created in partnership with LEGO® and Chicco®. For adults, there are parties and theme nights throughout the cruise, along with musicals, stage shows and magicians. MSC Armonia’s evening theater entertainment has undergone a complete review, with an entire line-up of new performances introduced on board. New stage shows include Abyss, a mermaid's adventures under the sea, and the Addams Family, with its hilarious cast of quirky and spooky characters. Broadway style entertainment includes French Follies and the Italian Touch, with artists, dancers and singers. There is always the casino for some real excitement, with slot machines and table games. In quieter moments, you can enjoy a great facial or relaxing massage at the Aurea Spa. With all the many options on the MSC Armonia, you’ll find the cruise experience fun and memorable. Enjoy spectacular views of the ocean while you dine in any of the eight restaurants onboard the MSC Armonia. You'll find specialty restaurants onboard to satisfy any craving, whether it's for Italian gelato or a good, old-fashioned hamburger by the pool. Happy Dinners and Fun Time Dinners are perfect for kids who would rather dine with other travelers their age, leaving the adults to enjoy a quiet, relaxed dining experience. Here are the restaurants you'll find onboard the MSC Armonia. Ristorante Marco Polo features traditional Italian cuisine and other Mediterranean dishes. Reservations are required, but the food is included in your fare. On formal nights, the Marco Polo is the place to show off your finest attire. Ristorante La Pergola offers fine Mediterranean cuisine in an elegant setting. Reservations are required in this sophisticated, formal dining room, but your meals are included in the fare. These special dinners are offered for younger travelers in the main dining rooms. Happy Dinners: Kids select their own meals from a children's menu, then eat while parents enjoy cocktails and appetizers. After the kids finish, they are treated to special games and events by the Kids' Club staff while parents finish eating. You must register children, aged 3 to 11, ahead of time. MSC Fun Time Dinners: Free and available on all MSC ships, Fun Time Dinners allow kids to dine in a separate, specially decorated area of the buffet restaurant with the entertainment team, then have fun in the Mini and Junior Club while parents enjoy a leisurely dinner alone. This Lido style casual buffet is open for breakfast and lunch, until 2 p.m.
Casual attire is appropriate, and no reservations are required. Buffet style serving a variety of breads, meats, salads, vegetables, specialty dishes and desserts. Specialty restaurant serving 3-course dinners including braised pork belly, filet mignon, Lobster Thermidor and cold-water lobster tail among other gourmet options. For $35, guests can order an appetizer and main dish followed by desserts that include guava cheesecake with warm rum sauce and 7-layer Mexican chocolate cake. This outdoor venue features hamburgers, pizza and pasta along with breakfast foods during early hours. Not open for dinner. No reservations are required and food is included in your fare. Enjoy outdoor dining with views of the water. Charming coffee bar where you can enjoy freshly brewed coffee and treats. Pastries are free with drink purchase. Open all day from 8 a.m. to 10 p.m. Adjacent to the pool area, the Ice Cream Bar features a variety of ice cream flavors and all the fixings at no charge Try every flavor! Open from 10 a.m. to 5 p.m. Casual dress always appropriate. Order a classic mojito with with mint leaves, sugar, lime, club soda and rum, or a creative variation, including Guava Mojito, Cape Cod Mojito or a Flightless Bird Mojito. Cozy British-style pub serving a wide selection of beers, including four new additions - Heineken, Newcastle Brown Ale, Murphy's Irish Stout and Lagunitas IPA. New complimentary menu of pub fare! Order a Cuban sandwich, mojo chicken quesadilla or avocado and tuna salad wrap.